The chart below extends my previous colour analysis to an even more mixed collection of books. 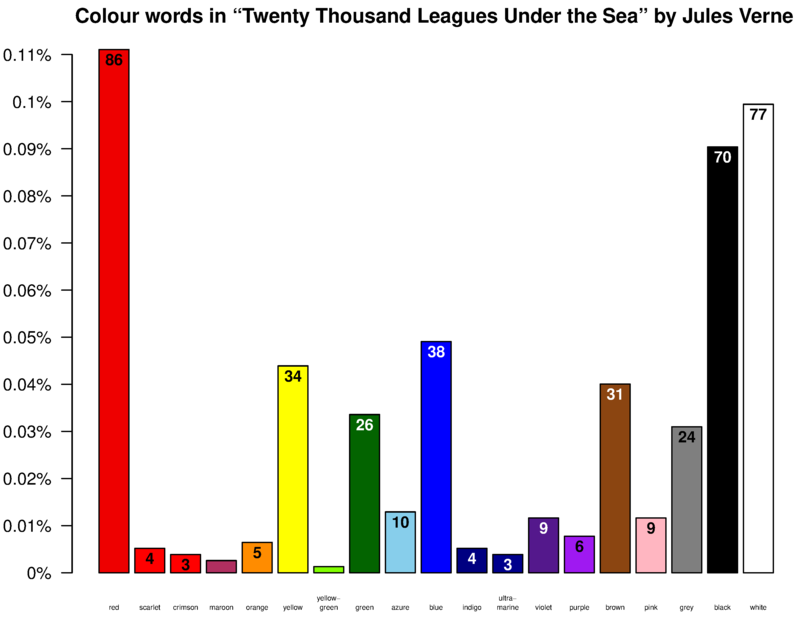 On the right are books with many descriptive passages involving colour, and thus a high frequency of colour words (calculated without excluding stop words this time). At the top of the chart are books with large colour vocabularies (counting colour words used twice or more). 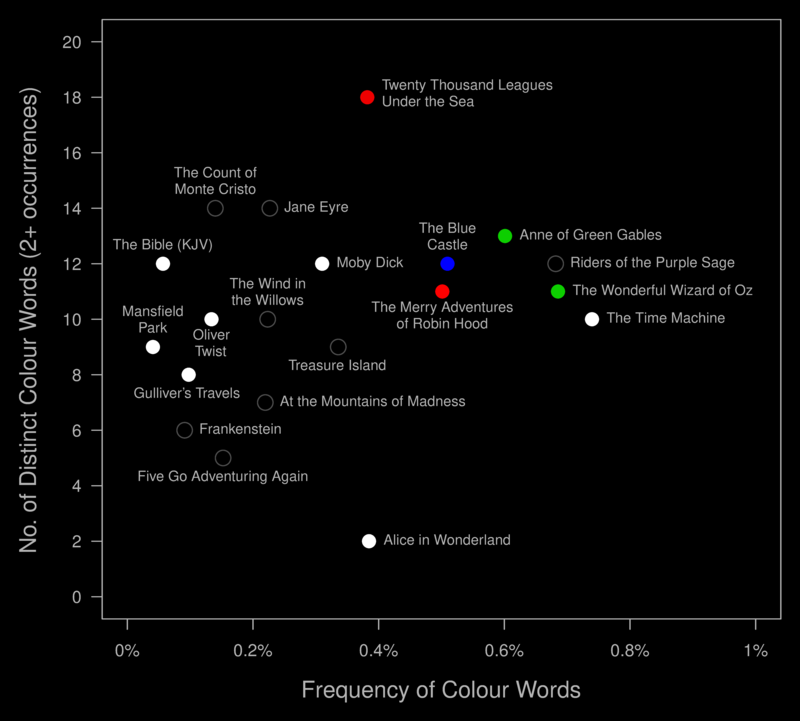 The dots show the most common colour word in each book. 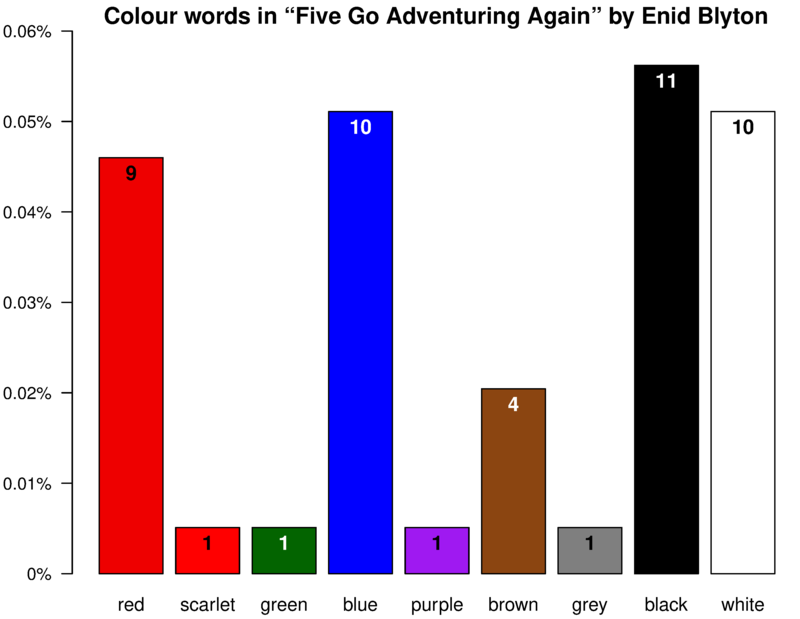 Results are consistent with the fact that the most common colour words in English (in decreasing order of frequency) are black, white, red, green, blue, yellow, brown, grey, pink, orange, and purple. 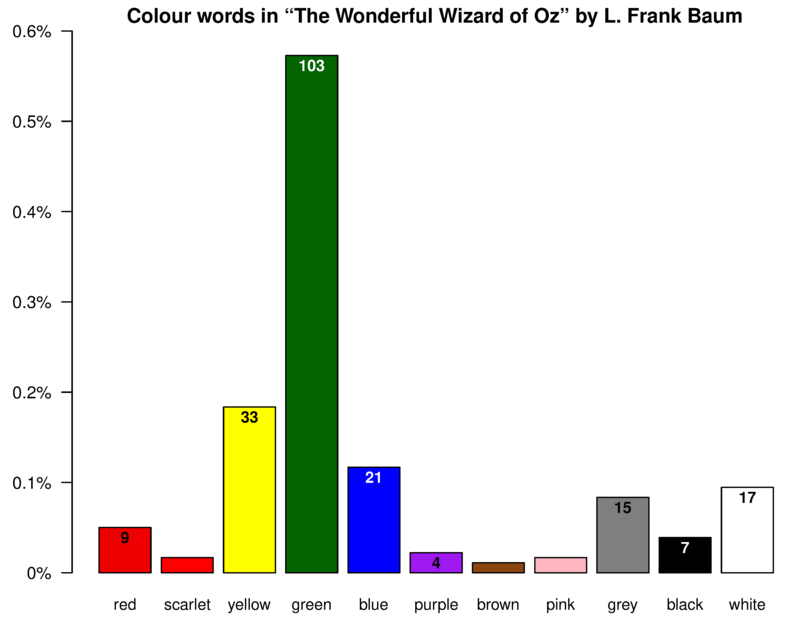 However, Anne of Green Gables and The Wonderful Wizard of Oz have “green” as the most common word for plot-related reasons, while The Blue Castle by L.M. Montgomery has, not surprisingly, “blue.” The Merry Adventures of Robin Hood by Howard Pyle has “scarlet,” some uses of which are as the name “Will Scarlet.” Twenty Thousand Leagues Under the Sea I have already discussed. A recent letter to Science by Stephanie Januchowski-Hartley and three PhD students expresses strong opposition to the controversial Dakota Access Pipeline (DAPL). The letter cites (an old version of) the Environmental Assessment for the DAPL, though not the 1261-page Army Corps of Engineers (ACE) report on the project. The authors of the letter assert that “To date the potential impacts of DAPL construction, or any potential spills, on aquatic or terrestrial species has not been adequately assessed,” but unfortunately do not indicate which sections of the existing Environmental Assessment dealing with those subjects they consider to be inadequate. A pallid sturgeon (Scaphirynchus albus) being released into the Yellowstone River by U.S. Fish and Wildlife Service personnel. The long version of the letter also implies that the endangered pallid sturgeon (above) would be adversely affected by the proposed DAPL crossing of the Missouri River at Lake Oahe. However, as the ACE report notes, pallid sturgeon are in fact very scarce in Lake Oahe. This is because, ever since that lake was formed by the 1958 Oahe Dam, the waters have been unsuitable for reproduction of that species. The remaining pallid sturgeon are primarily found elsewhere. The ACE believes that the pallid sturgeon is unlikely to be adversely affected by the DAPL. It is true that older oil pipelines can and do rupture with disturbing frequency. For example, the Poplar Pipeline in Montana, built in the 1950s using faulty welding techniques and laid in a very shallow trench under the Yellowstone River, spilled a substantial amount of oil in 2015. However, even that spill does not seem to have harmed the fish there (in contrast to the quite serious negative effects on fish typically seen for marine or wetland oil spills). 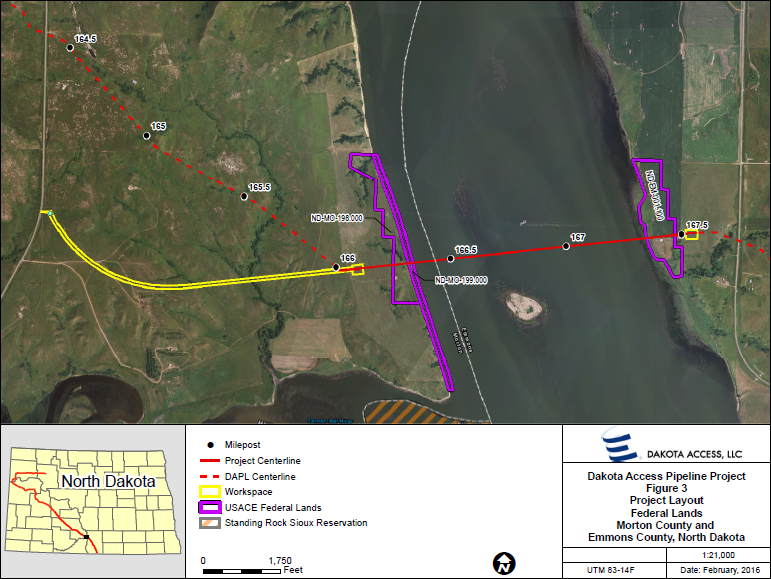 Map from the Army Corps of Engineers report, showing DAPL crossing point at Lake Oahe. The authors of the letter also state that cultural impact assessments of the DAPL have been inadequate (although the court thus far disagrees, noting cultural surveys conducted by licensed archaeologists, and a consultation process that began in 2014). The proposed river crossing runs just north of the Standing Rock Indian Reservation (see map above). The Standing Rock Sioux Tribe claims that DAPL construction has destroyed cairns and sacred burial grounds near the crossing, although North Dakota’s chief archaeologist says that no burial sites or significant sites were destroyed (and it is a little difficult to see how DAPL construction in the disputed area could have damaged any significant sites, since the DAPL there closely follows the path of the 1982 Northern Border Pipeline, as indicated by a visible line on satellite imagery and by black and yellow “Caution: Gas Pipeline” signs visible in photographs taken at protest sites – i.e. the relevant land was already bulldozed and restored 34 years ago). Early in the planning stage, a DAPL route further north was apparently considered. This would have not have been collocated with existing pipeline to the same extent, would have been 10.6 miles longer, would have crossed more agricultural land, wetlands, and floodplain, and would have cost the company behind the DAPL $22.6 million more. Still, the company may now be wishing that they had followed up that option. DAPL construction, elsewhere along the route (photo: Tony Webster). The whole topic is of course a political hot potato, being a major source of conflict between, on the one hand, mainstream US Democrats (including construction-worker unions and the Clinton campaign), and, on the other hand, followers of Bernie Sanders and the Greens. Further complicating matters is that some land in the Dakotas was assigned to the Sioux by the 1868 Treaty of Fort Laramie, and unjustly taken from them (over 1 billion dollars has been provided in compensation, following litigation by the tribe, but the tribe has nevertheless refused the money, wanting the land instead). At the same time, increasing tensions in the Dakotas are likely to damage the tribe’s casino business over the longer term. Traffic churning out greenhouse gases. Protests against the DAPL have also been linked to climate change, but the project in fact makes little or no difference to US fossil-fuel consumption. Oil can also be shipped within the US by rail (although this is less safe) and by ship from overseas oilfields. I think that activists would do better to campaign for e.g. public transport to replace inefficient individual automobiles, which produce copious greenhouse gases (solar cars would make a good alternative as well!). I must admit that I also struggle to understand activists who drive convoys of gasoline-powered vehicles to anti-fossil-fuel protests. Luitzen Egbertus Jan Brouwer (27 February 1881 – 2 December 1966) was a Dutch mathematician who founded intuitionism and made important contributions to topology, such as his fixed-point theorem, which states that every continuous function f mapping a compact convex set into itself has a fixed point a [i.e. f(a) = a]. A consequence of the theorem is when a crumpled sheet of paper is placed on top of (and within the boundaries of) a copy of itself, at least one point on the top sheet lies over the corresponding point on the bottom sheet. Brouwer had a huge impact on mathematics and logic in the Netherlands, influencing people such as Arend Heyting (student), Dirk van Dalen (grandstudent), and Henk Barendregt (great-grandstudent). The Dutch Royal Mathematical Society (Koninlijk Wiskundig Genootschap) is organising a special event marking 50 years since Brouwer’s death. The event is on 9 December in the Amsterdam Science Park. It looks to be an interesting event. Details here. Having previously mentioned children’s fantasy literature, I thought I might follow up the theme a little more. In one kind of children’s novel, a group of child protagonists resolve some serious dilemma with little or no adult assistance (generally, the plot involves adventure of some kind). Such a story prompts the child reader to ask: “How would I handle a problem like that?” Of course, such a story also requires a reason for the lack of adult help. There appear to be four main possibilities, which I list below. Can my readers think of any others? One common reason for the children to act independently is that the adults are complicit in an evil that the protagonists struggle against. A classic example is The White Mountains by John Christopher (1967). Thirteen-year-old Will is looking forward to his coming-of-age ceremony, until he discovers that this involves a mind-control device being implanted in his brain by the aliens who control the Earth. This kind of novel inevitably focuses on escape – in Will’s case, a dramatic journey on foot from England to the “White Mountains” of the title. The White Mountains by John Christopher (1967). Another option involves stranding the protagonists in a location without helpful adults. The journey to this location can be undertaken through either physical or magical means, and the focus of the novel is on achieving some goal(s) and then returning home. A famous example is The Wonderful Wizard of Oz by L. Frank Baum (1900). The Wonderful Wizard of Oz by L. Frank Baum (1900). The “desert island” option can be combined with option #1 – that is, there are adults on the island, but they are pirates (or evil in some other way). An example would be the planet Camazotz in A Wrinkle in Time by Madeleine L’Engle (1963). A Wrinkle in Time by Madeleine L’Engle (1963). Something Wicked This Way Comes by Ray Bradbury (1962). A somewhat less satisfactory variation of this option is simply to make the adults too busy to pay attention. Alternatively, the “unbelievable story” option can be combined with the first two. For example, The Lion, the Witch and the Wardrobe by C.S. Lewis (1950) combines elements of all three options. The Lion, the Witch and the Wardrobe by C.S. Lewis (1950). Finally, the dilemma can involve a conflict which is so serious that it forces the recruitment of what are essentially child soldiers. The City of Gold and Lead (John Christopher, 1968) and The Pool of Fire (John Christopher, 1968), the sequels to The White Mountains, are two examples. The City of Gold and Lead by John Christopher (1968). Other examples of this option include Ender’s Game (Orson Scott Card, 1985) and Tomorrow, When the War Began (John Marsden, 1993). Ender’s Game by Orson Scott Card (1985). Of course, there are many other kinds of children’s literature, and protagonists may also be adults, talking animals, hobbits, or other creatures. But exploring those is out of scope for this post, which is already an odd one for a science blog. The ESA/RFSA ExoMars lander seems to have crashed on Mars, unfortunately. The chart above shows the planned sequence of events (which was to have ended with a soft collision). 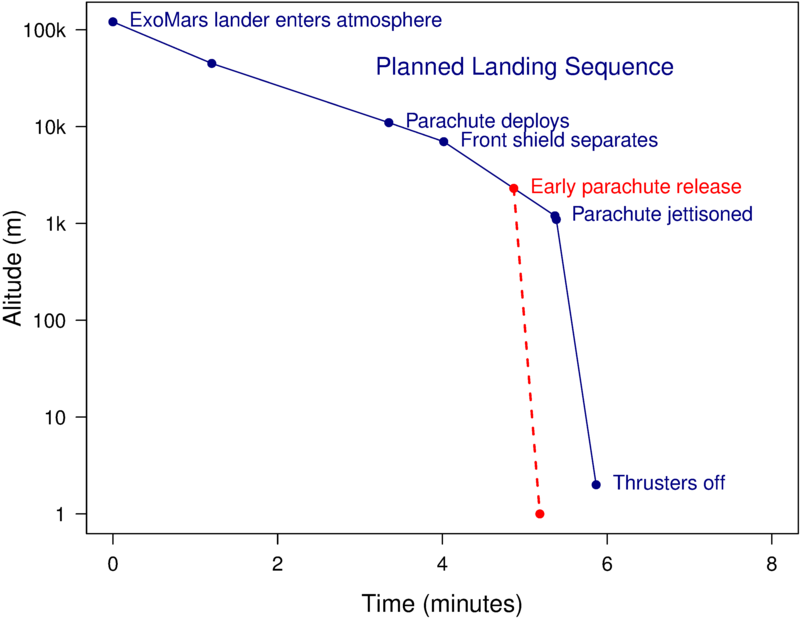 Instead, we seem to have had an early parachute release, with a very brief use of thrusters, followed by loss of signal after 19 seconds – consistent with free-fall to the surface under Martian gravity. Update: the crash site seems to have been identified. The ESA/RFSA ExoMars mission (see ESA image above) will launch its Mars lander tonight. The livestream is here. Hopefully we’ll see some great pictures and some good data as it lands on Mars! Update: the landing seems not to have gone well, unfortunately.